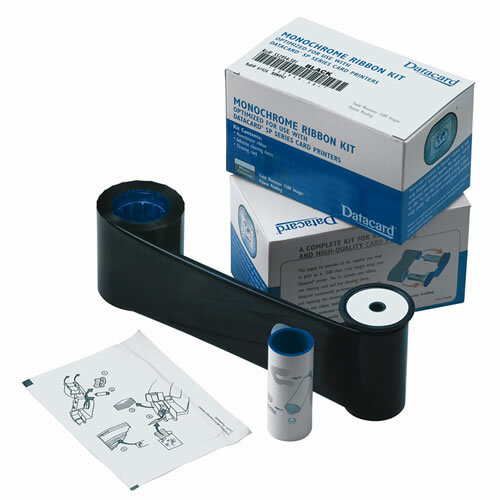 Part number 552954-502 dark blue print ribbon for Datacard SP35 Plus, SP55 Plus and SP 75 Plus card printers. 1500 images. This monochrome ribbon kit includes: one ribbon, one cleaning card and one cleaning sleeve. It contains needed cleaning supplies for the Datacard SP35 Plus, SP55 Plus or SP75 Plus model operations. Protect your investment by using only Datacard Certified Supplies. Datacard engineers performance and reliability into every system=matched supply item offered. For you, that means smooth printing, brilliant image quality, high security an exceptional performance. Datacard's SP Plus Series printers use printer ribbons designed sepcifically for Datacard printers. When a Datacard ribbon has been loaded, the Datacard printer senses the action and enhanced product features are enabled and card printing can begin. The printer will only print the color images when Datacard color ribbons are installed. Datacard is your exclusive source for proprietary ribbons for these card printers.